TSProcessor is an EBIF application filtering, replacement and monitoring system. It is designed to be present in the cable delivery path allowing detection, modification and analysis of transport streams which could potentially contain EBIF applications. Filtering - filters out EBIF applications based on configurable criteria for passing them through, to prevent the transmission of unauthorized or unsuitable applications. Replacement - TSProcessor replaces EBIF application signals and content based on configurable criteria. Logging - TSProcessor provides an EBIF application logging function, to allow an operator to see when, where and how EBIF applications have been run. 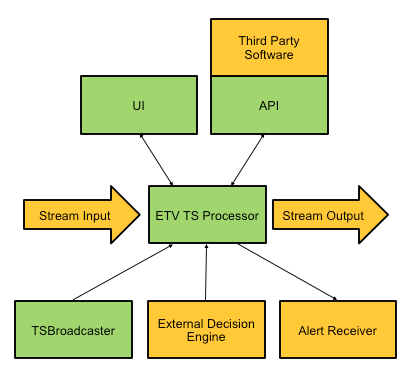 Capture - TSProcessor records all EBIF application signals, content and events, to allow an application to be reconstituted and replayed offline. Bit-rate Protection - allows removal of applications over a specified bit-rate. Alert - TSProcessor provides alerts on selected significant events to allow investigative or corrective action to be initiated. Delay Applications - to allow for video re-encoding. Adds latency to ensure correct synchronisation of applications and video.